In an engineering first, Stanford University scientists have invented a low-cost water splitter that uses a single catalyst to produce both hydrogen and oxygen gas 24 hours a day, seven days a week. The researchers believe that the device, described in an open-access study published today (June 23) in Nature Communications, could provide a renewable source of clean-burning hydrogen fuel for transportation and industry. Hydrogen has long been promoted as an emissions-free alternative to gasoline. But most commercial-grade hydrogen is made from natural gas — a fossil fuel that contributes to global warming. So scientists have been trying to develop a cheap and efficient way to extract pure hydrogen from water. In these devices, each electrode is embedded with a different catalyst, typically platinum and iridium, two rare and costly metals. But in 2014, Stanford chemist Hongjie Dai developed a water splitter made of inexpensive nickel and iron that runs on an ordinary 1.5-volt battery. In conventional water splitters, the hydrogen and oxygen catalysts often require different electrolytes with different pH — one acidic, one alkaline — to remain stable and active. 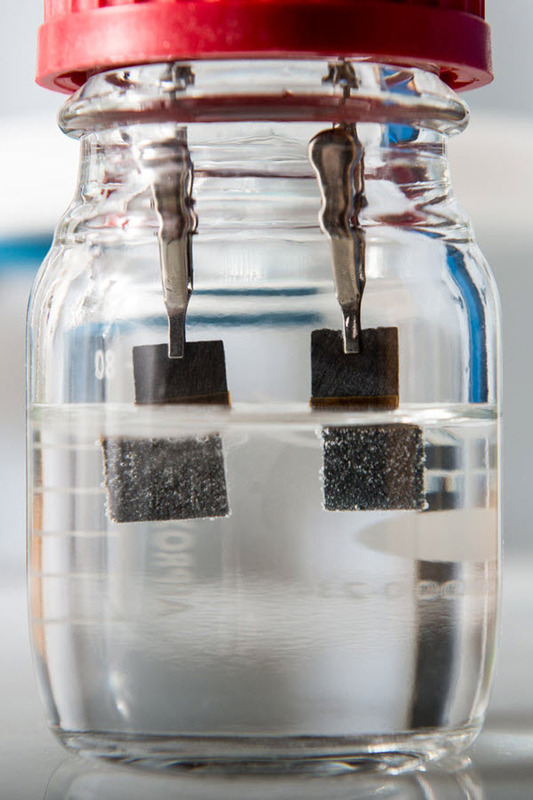 “For practical water splitting, an expensive barrier is needed to separate the two electrolytes, adding to the cost of the device,” Wang explained. Wang and his colleagues discovered that nickel-iron oxide, which is cheap and easy to produce, is actually more stable than some commercial catalysts made of expensive precious metals. Using one catalyst made of nickel and iron also has significant implications in terms of cost. Developing earth-abundant, active and stable electrocatalysts which operate in the same electrolyte for water splitting, including oxygen evolution reaction and hydrogen evolution reaction, is important for many renewable energy conversion processes. Here we demonstrate the improvement of catalytic activity when transition metal oxide (iron, cobalt, nickel oxides and their mixed oxides) nanoparticles (~20 nm) are electrochemically transformed into ultra-small diameter (2–5 nm) nanoparticles through lithium-induced conversion reactions. Different from most traditional chemical syntheses, this method maintains excellent electrical interconnection among nanoparticles and results in large surface areas and many catalytically active sites. We demonstrate that lithium-induced ultra-small NiFeOx nanoparticles are active bifunctional catalysts exhibiting high activity and stability for overall water splitting in base. We achieve 10 mA cm−2 water-splitting current at only 1.51 V for over 200 h without degradation in a two-electrode configuration and 1 M KOH, better than the combination of iridium and platinum as benchmark catalysts.